How much does CSUCI cost for tuition now, and how much will they ask for tomorrow? How do these charges rival other colleges? Find out here. Knowing tuition and fees related to going to California State University - Channel Islands will enable you to plan a budget for your college years. Look at the numbers below to understand how CSUCI's price compares to other colleges and if you need to arrange for a rise in tuition. For nationwide, regional and statewide comparisons, check out the following table to find out how CSUCI compares to other colleges. The cost of tuition and fees at CSUCI is reduced dramatically for students living in California. Tuition and fees for in-state students is set at $6,817 for the 2017 - 2018 year, a 63.5% discount off the full price. Tuition is $5,742 and fees $1,075. Out-of-state students at CSUCI spent $18,697 in tuition and fees in 2017 - 2018. $1,075 was charged for fees, and $17,622 was charged for tuition. How much does CSUCI cost part time? For more information, check out CSUCI Part Time Tuition & Fees. 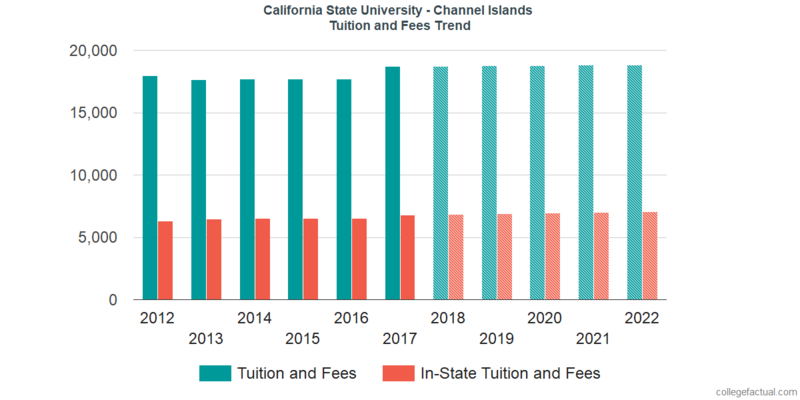 Tuition and Fees for out-of-state students attending California State University - Channel Islands increased with a typical yearly rate of 0.2% within the last five years. Over that same period, tuition increased by 0.0% and fees increased by 2.5%. Due to this, we predict the price of tuition and fees this year will be $18,725. At this rate, we estimate the total cost of tuition and fees for a two year degree to be $37,478 and for a four year degree to be $75,069. This doesn't cover other charges including room and board, transportation, and books. View projected potential tuition and fees for CSUCI students which includes residency based reductions in the next chart. Because of the cost of living along with other variables, the cost of college tends to grow each year. For this reason your last year of school will be much more than your initial year.